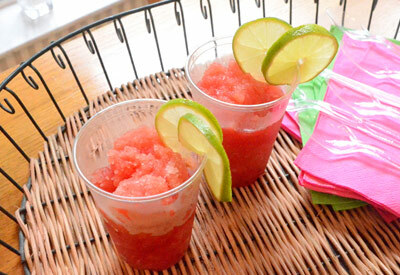 Add watermelon, sugar and lime juice into blender and puree until smooth. Pour into a 9x9x2- inch metal baking pan and freeze mixture for 1 hour. Stir and break apart any frozen parts with a fork. Cover and freeze mixture for about 2 hours until firm. Using a fork, vigorously scrape tines across the top of the frozen mixture to form icy flakes. Divide among serving dishes. Recipe can be prepared 3 days ahead. After scraping mixture vigorously with a fork to form icy flakes, cover tightly with foil and keep frozen. Just before serving, give icy flakes a good scrape and pour into serving dishes.